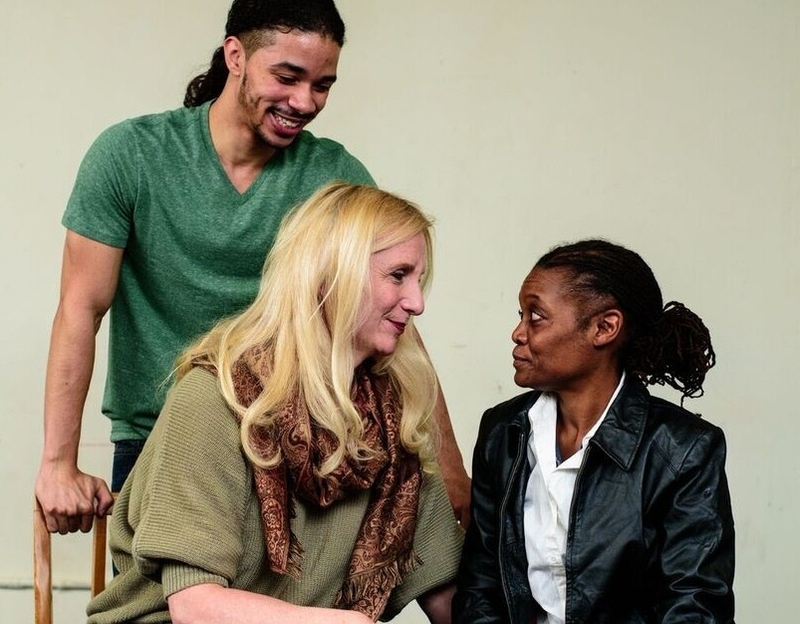 CHICAGO – Pride Films and Plays is excited to present the World Premiere of David Valdes Greenwood’s comedy Raggedy And, opening March 12, 2016 at Rivendell Theater. Delia Kropp will be the first transgender actress to portray a trans character for a major Chicago stage production. And the previews for the production will benefit two non-profit organizations – Illinois Safe School Alliance on Thursday, March 10, and the Legacy Walk on Friday, March 11 – with $5 from each ticket sold for those performances benefiting the organization. In Raggedy And, a fast-paced ultramodern comedy of manners, the perfect poet is needed for the impending inauguration of America’s first female president. When Ondi Rivers, a trans woman, is selected, her wife hits the roof and her son is torn. Imagining the glare of the media spotlight on her family’s private life, will she take the stage? The cast includes Averis I. Anderson as Ben, Delia Kropp as Ondi, Katurah Nelson as Clem, and Manuel Ortiz as Jayden. Designs are by Rebecca Hamlin (set), Raquel Adorno (costumes), Keith Dukavicius (original music and sound) and Cat Wilson (lights). Raggedy And by David Valdes Greenwood and directed by Cecilie D. Keenan, has previews on Thursday and Friday, March 10 and 11 at 7:30 ($15). Regular performances are Thursday, Friday, and Saturday at 7:30pm and Sunday at 3:30pm through April 10. Tickets are $22 Thursdays, and $27 on Fridays, Saturdays and Sundays. There is a special industry night performance on Monday, March 21, 7:30 with tickets $22. Discounts are available for students and seniors. The performance is at Rivendell Theater, 5779 N Ridge, and tickets can be purchased at 1-800-737-0984 or online. The Legacy Project combats anti-gay bullying by promoting the contributions Lesbian, Gay, Bisexual, and Transgender (LGBT) people have made to world history and culture. Its central tools are “The Legacy Walk” – a half-mile outdoor streetscape featuring bronze memorial markers affixed to the “Rainbow Pylons” on North Halsted Street; “The Legacy Wall” – a traveling installation that explores the power of LGBT history to transform school climates; and the Legacy Project Education Initiative – “LPEI” – which creates education resources and multimedia to inspire and teach young people about all that LGBT people have contributed to the world we share. To learn more visit www.legacyprojectchicago.org.